View More In Massage Oils. Ingredients: Helianthus annuus (Sunflower) Seed oil, Isopropyl palmitate, Decyl oleate, Citrus nobilis (mandarin orange) peel oil, Cupressus sempervirens oil, Rosmarinus officinalis (Rosernary) flower extract, Citrus limon (Lemon) peel oil, Schinus terebinthifolius seed extract; Tocopheryl acetate, Garcinia cambogia fruit extract, PauIlinia cupana seed extract, Equiseturn arvense extract, Fucus vesiculosus extract, Hedera helix (Ivy) extract, Spiraea ulmaria flower extract, Tocopherol, Hydrogenated palm glycerides citrate, Limonene, Linalool, Citral. 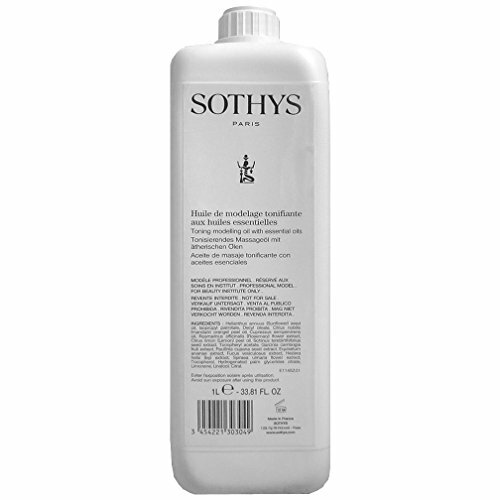 If you have any questions about this product by Sothys, contact us by completing and submitting the form below. If you are looking for a specif part number, please include it with your message.